I know that it’s January, but I am so very glad that the month of October is done as this had been the most nerve racking and stressful month to date. You know when people say “don’t take your car to the dealer for repairs because you always leave with more things wrong when you get it back.” I used to think that was a bunch of bull until it happened to me. After wrapping up my media visit to the Orange County International Auto Show I returned to my car what could be described as a crime scene. There was a pool of fluid running from under my car. When I started the car, it would groan in agony as I attempted to turn the very heavy feeling steering wheel. Great! The power steering went out in horrific fashion after enjoying my first automotive media event. My goal for the day was to leave the show, grab a bite to eat and then go shop for a car for my son. Now I’m stranded in Orange County and the shop I usually go to is 40+ miles away. Knowing that there was no way that my car could be repaired this late in the afternoon I decided to give the local Audi dealership a call. I was going they could take my car in today and provide me a loaner since I still needed to be mobile. They were willing to allow me to drop off my car and provide me a loaner, I just needed to get towed there. I called up AAA and they dispatched a very nice tow truck driver to the rescue. Since my car is lowered and all-wheel-drive, a flatbed truck is always recommended. The problem this day was that my car was parked between the 1st and 2nd level of a multi-level parking structure. Adding to the dilemma, the Auto Show just opened to the public and hundreds of cars were arriving. Great! The AAA driver arrived in one of the smaller trucks that only tows the front 2 wheels. This style of truck was dispatched because it was small enough to fit inside the parking structure. After assessing my car, the driver was advised by dispatch not to start the car. He was instructed to roll the car out of the parking structure without starting it so as to not damage the power steering pump. I would then need to wait for a larger flatbed tow truck that would be better equipped to transport an all-wheel-drive vehicle. I assisted the tow truck driver with pushing the car safely down the ramp and out into the wide open parking lot of the convention center. I waited patiently for a flatbed truck to arrive and transport my vehicle to the near by Audi dealership. The dealership was great in taking in my car and providing me with a loaner. I had the pleasure of driving a nicely equipped 2016 A6 2.0T for the week as they repaired my car. At the end of the week I received a hefty bill for the replacement of new power steering lines and I was back in the TT. Over the next few days of driving, a multitude of issues occurred. First the belly pan that protects the underside of my car drooped down and dragged itself along the freeway for a few miles turning it into Swiss cheese. I was able to add some zip ties so that it would no longer scrape the ground. A few days later the AC stopped blowing cold air. That was a long sweaty drive back home from Fontana…smh! I contacted the dealer about these issues on Saturday and was advised to bring it in and they would look at it. That following Monday on my way to the dealership my car starts overheating forcing me to have it towed once again. The dealership diagnosed a faulty wire harness that burned out and could have potentially set fire to the car. There are reports of this happening and is a known issue with VW/AUDI with their older platform vehicles, namely the Beetle, Audi TT and GTI, all of the same era (2000-2005). This faulty wire harness is like an artery that connects the alternator, battery and a few other vital vehicle electronics. So as you can see, it’s an important harness. I had it towed in and I was back in another loaner. 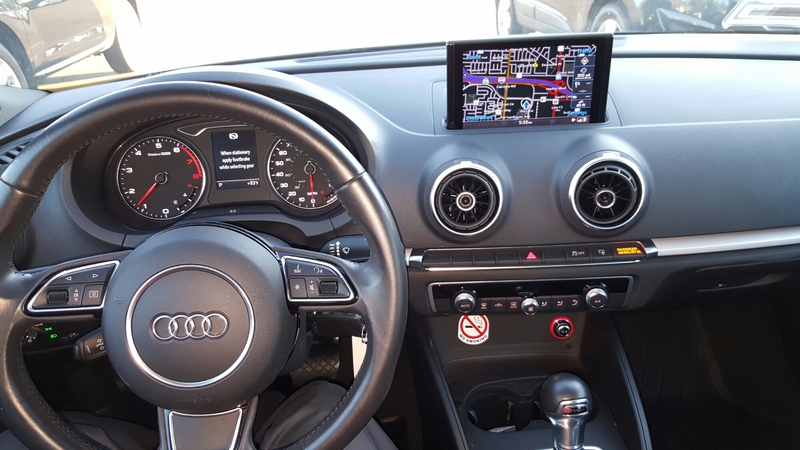 This time it’s a 2016 A3 1.8T. Another week goes by and my car is ready for pick up once again. 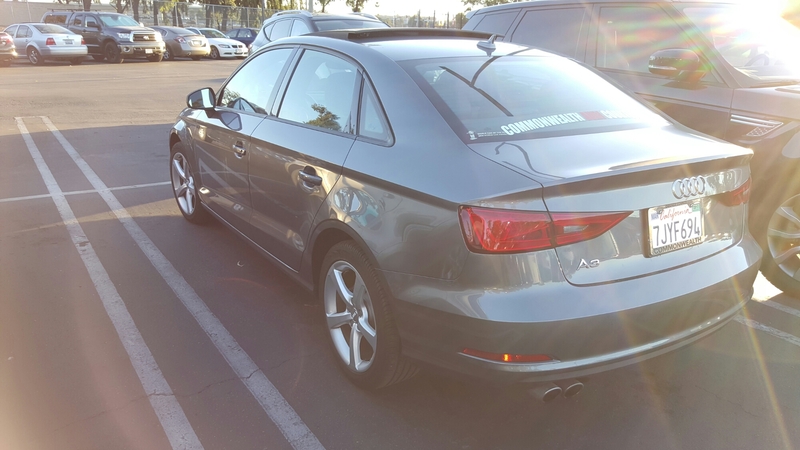 I return the loaner A3, which I was not that impressed with, but it was more impressive than the A6 I had a week prior. The A6 just didn’t feel right…kinda quirky I guess. I pick up the TT leaving behind another paycheck at the dealership for the repair work and headed home on a Thursday night. 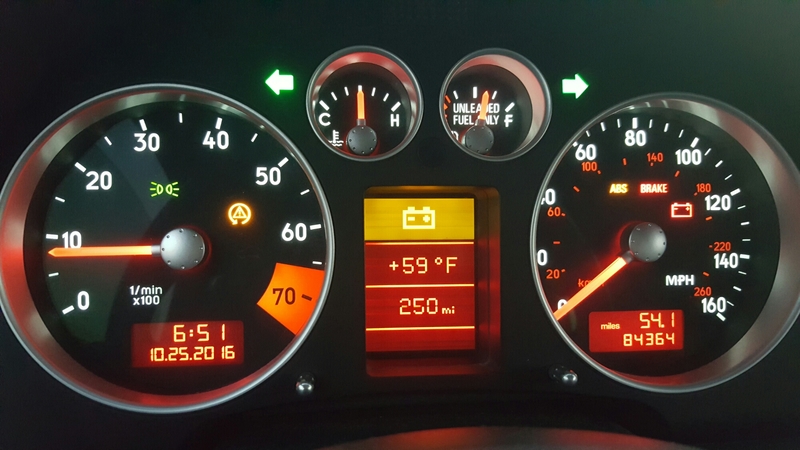 Tuesday morning of the following week as I was headed to catch my commuter bus, the dashboard lights of the TT all start flashing and the car starts losing power. I was able to safely pull off of the freeway and immediately contacted the dealership. They refused to send out a tow truck for my vehicle because I did not purchase my vehicle from them, so AAA gets the business for a 3rd time this month. No offense, but if I have to listen to another tow truck driver tell me his life story, I’ll have to pass on them giving me a ride in and just walk the 40 miles to work, lol. Now remember when I said how that wire harness was important and connected to basically the heart of the car. Well the tech at Audi didn’t bother to check the alternator or battery before releasing the car to me last week and they both needed replacing. I assume that I am not the only person finding all this a little too coincidental. 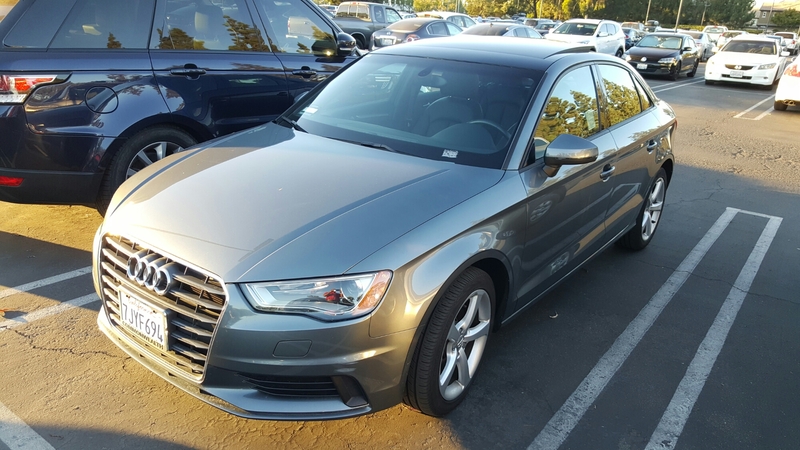 Loaner #3 was another 2016 A3. After talking with the dealership about all the money they were siphoning from my bank account, I picked up a very budget friendly alternator which they agreed to install at a discounted rate. Before picking up the TT after they replaced the alternator they call to tell me I now need a new battery. My words to the service writer “You mean to tell me that you let the battery drain as it was sitting in your bay waiting to get repaired. This is ridiculous.” After a bit of arguing they installed a new battery for free. Upon picking up the car I recalled my conversation with the service manager about taking care of my belly pan as that was my initial complaint about their work they performed (tech didn’t secure the pan). Well guess what, they didn’t take care of it. I stormed into his office and after giving him a few choice words, he agreed to order me one and I could come back and have them install it on the car. I’ll be back for the pan, but no touchy! A month later and more electrical issues have started to surface with this car. I’ve got the German car blues. Now I see why you don’t take your car to a stealership or but a German car without a warranty because the dealership will find ways to get paid and shift blame. I’m sorry for the long post, but I had to share my story. Ouch…Mike, that’s one reason i let the CL55 go..I’ve heard stories like yours before.The Germans make some fun toys but..once outside that warranty period..you’ve just entered.. the Twilight Zone.